Canon G16 vs Canon G15, take a look at the major specification comparison review to find out the major difference between these two camera. 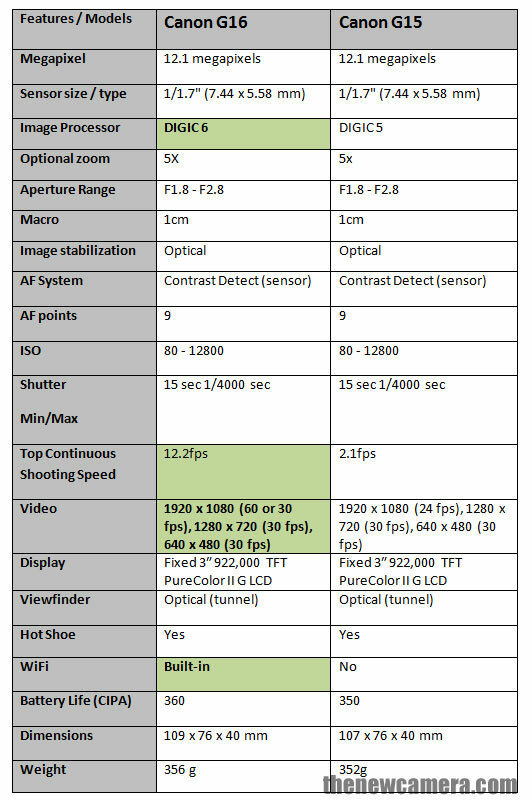 The Single Major difference between these two model is new image processor, due to high speed processing we get 50% fast AF speed compared to G15, less shutter lag, maximum continuous shooting speed of 9.3 FPS at full-resolution for over 500 shots as well as a High Speed AF system for maintained sharpness in a variety of shooting conditions. Other new feature include Built-in WiFi for wireless image transfer, + Canon smartphone app available for iOS and Android devices, enables efficient transferring control and also permits GPS tagging to images. Better Video Quality: Canon G16 offers Full HD @ 60fps, G15 was limited to 24fps only at Full HD mode. Verdict: Canon G16 is a powerful camera with advance image processor , Fast AF speed, better video mode. Highly Recommended by New Camera.